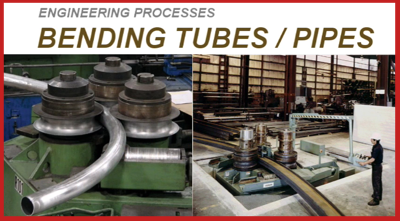 Bending and shaping steel or copper tubes / pipes can be easy when the correct equipment is used. Without the necessary equipment the outcome can be poor and unprofessional. The skills can be mastered quite quickly although care is always needed. The easiest method is to use a spring that fits inside the tube. This is suitable only for copper. The spring must be the correct size and fit accurately inside the tube. The spring is the type often used by plumbers. The copper tube can be bent slowly over the knee. However, great care should still be taken as the tube wall can collapse and become distorted. A ‘trade tip’ is to bend the pipe slightly more than required and then return it to the exact size. This allows easier removal of the spring. The spring is removed by pulling the ring at either of the ends. If an unusual bend is needed this can be best achieved by filling the tube with sand. The grains of sand prevent the distortion of the tube wall. This technique works best if a jig is used to bend the tube round. This technique is not always precise and takes practice. If a sharp bend is required a 90 degree plumbers joint can be used. This can be soldered in position using a simple blow torch, flux and solder. This is most suitable where a tight bend in the tube is required. A pipe bender is the piece of equipment used to bend tube to a precise radius. The rounded channel can be replaced with one that has a larger or smaller radius. The tube is first positioned in a straight grooved block - this holds it firmly. The lever arm is then rotated, bending the pipe slowly to the shape of the rounded channel. With great care, even unusual shapes can be achieved. Sometimes the tube may need to be packed with sand to prevent distortion and weakening of the tube wall. The tube on the outside of the guitar has been shaped / formed on a pipe bender, one curve at a time. A card template is first drawn and the tube folded accordingly using a pipe bender.